When it was discovered by scientists working at CERN in Switzerland, the Higgs Boson was one of the most momentous discoveries in scientific history, changing the way we look at the structure of our universe. At the same time, it raised some strange questions surrounding our own quantum worlds: what are we made of? How does the Higgs work? More importantly, what even is a Higgs Boson? For science novices like myself, the overarching concept of the Higgs was intriguing but the science-speak of those involved with its discovery was nothing short of baffling. That’s where poet Katrina Porteous and composer Peter Zinovieff come in. Having worked together on projects before, the pair have teamed up once again to create Field, a mix of spoken word and music that even the scientifically-challenged like myself can understand. Before the project comes to the Planetarium at the Life Science Centre in Newcastle, I caught up with Katrina to ask her more about the project and the concepts behind it. What has inspired the pair of you to look at the Higgs Boson and our universe in Field? Why does the sun shine? Why do stars, planets, galaxies and human beings exist at all? How can we be made of stardust? What is time? All these questions are addressed by the “Standard Model” of particle physics, and the proof of the existence of the Higgs is a cornerstone of that theory. What could be more inspiring to a poet and composer? Can you tell us more about the process that you went through to create Field? I have no background in physics. To create Field I had to learn some basics. I had great support from physicists like Dr Tom Lancaster of Durham University. Even so, after several months’ immersion in the subject, I realise that I know nothing; only enough to ask naive questions. I hope that Field can at least open up some of those questions to a non-scientific audience. Peter Zinovieff has a very different background. He is a scientist and a brilliant inventor. He was one of the first people in the world to use computers in music. Peter is an inspirational figure, and I would not have had the confidence to approach such a difficult subject without his enthusiasm for it. He began the creative process for Field by drawing a structure. He suggested that it should have seven parts, and that the music of each part should contain a symmetry. Symmetry is the key idea underlying quantum field theory. 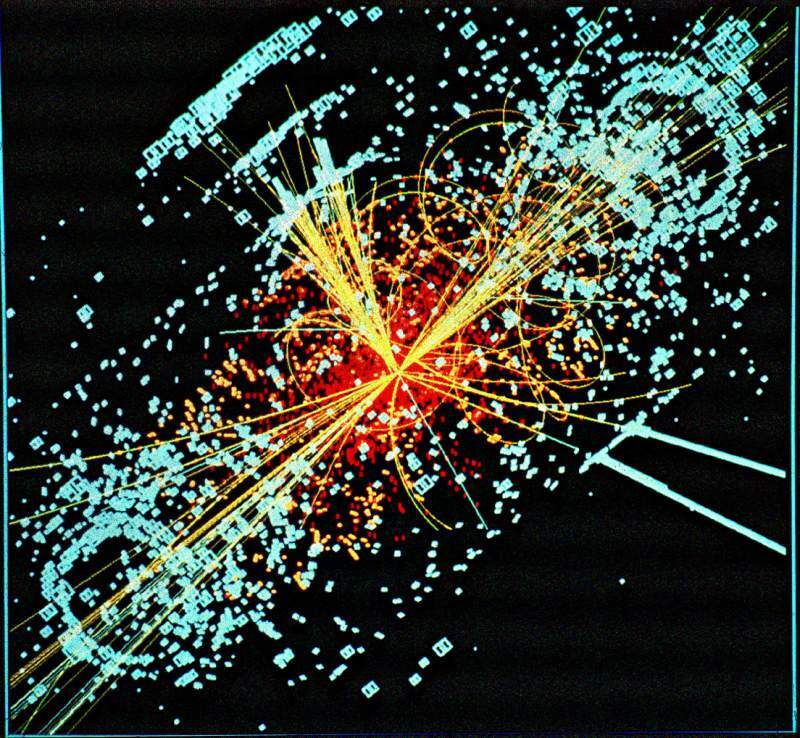 The Higgs, which makes reality possible, breaks the initial symmetry of the universe. Seven is a good number because it gives our piece an asymmetric shape. Peter lives in Cambridge and I live in Northumberland, so most of our collaboration has been electronic. We wrote the music and poetry in parallel. Peter’s music includes a theme played on real instruments, which continually recurs, and represents the Higgs field constituting the background to all reality. Each of the movements is divided between a section of music with words, and a section of music without. The universe and our place in it – including what makes us human – is often a theme in music and literature. I wondered if this is a subject either of you have tackled before? The themes of Field have occupied us both for a long time. 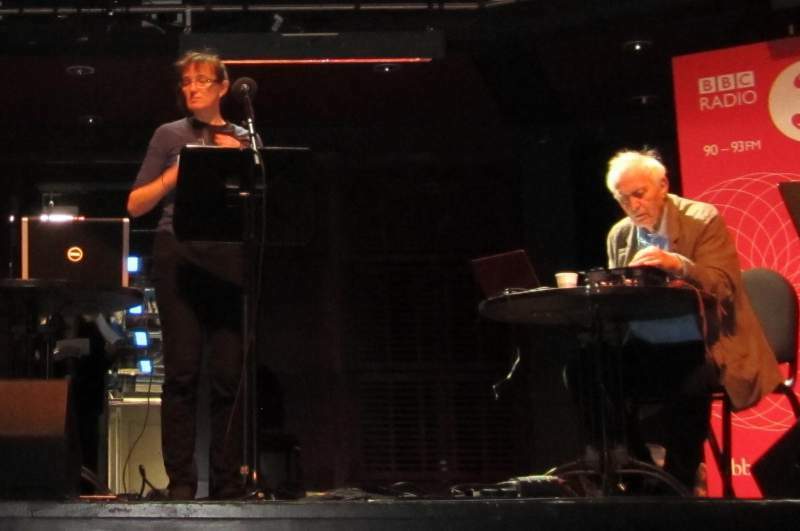 The interplay of rules and randomness, on which quantum theory is based, has been central to Peter’s lifetime’s work in computing and music. In my own work I’ve always been obsessed by the nature of time. Peter and I were thinking about geological timescales in the first piece we wrote together, Horse. Our first piece for Life planetarium, Edge, was a tour of four moons in our solar system. Two of those moons could potentially host processes necessary for primitive life. But they are still hostile worlds. They made us reflect on what is so unusual – possibly unique – about our own habitable planet and human consciousness. Field will apparently explore some of the theoretical implications behind the finding of the Higgs Boson. What type of implications do you think this momentous discovery has? The Higgs was discovered in 2012 by two teams working at the Large Hadron Collider in Switzerland. It was an amazing moment, because it provided actual physical evidence of what the mathematical theory had suggested for many years. This was a moment of completion for the “Standard Model,” which tells us that all reality is constructed from a small number of fundamental particles. The Higgs is particularly important because it provides the mechanism which gives all matter its mass. Without mass, there would be no gravitational attraction, and therefore no stars, planets or galaxies. The theory behind the Higgs was mathematically predicted by a number of scientists, among them Newcastle-born Peter Higgs, who gave it its name. So it has a real local connection. It’s also very topical, because the Large Hadron Collider has just been switched on again after two years of upgrades. It’s the biggest machine ever built, and it’s being used to explore the smallest building-blocks of matter. It’s incredibly exciting. Theoretical physics raises many questions. By recreating the conditions of the very early universe, the LHC could provide some answers and further leads. For example, the theory suggests that the symmetry of the Standard Model is part of a greater “super-symmetry.” Cosmology also indicates that the universe is largely composed of mass which we can’t see: “dark matter.” The LHC could provide proof for these theories. These are the most exciting developments in our knowledge of the universe and our place in it. How could anyone not find it inspiring?! The performance is split into seven movements, but only lasts 25 minutes in total; was it challenging to put so much into a relatively short space of time? One problem I found was that everything in quantum theory relates to everything else. Fortunately I was not trying to explain anything, only to evoke some things. The explanations reside in very long books like Roger Penrose’s brilliant The Road To Reality. Field is taking place in the Planetarium of the Life Science Centre. How are you going to make use of that unique space during the performance? Field is written specially for the planetarium. Peter’s music is in surround-sound, and planetarium supervisor Christopher Hudson is preparing a fantastic visual display to accompany it. We’ve selected stunning images from the Hubble Space Telescope. Many of these show light from stars in the early universe. Others show clouds of dust from which stars are formed. These real images from the distant cosmos show the large-scale effects of very small quantum processes, such as the forces which bind atoms and molecules together. They clearly illustrate the way mass (the result of the Higgs) causes gravity to bend space and time. No one knows exactly how quantum theory fits with our large-scale universe. That is the great unanswered question, which Field also addresses. Even though I’m interested in the subject, I was always terrible at physics in school and didn’t really understand a lot of it; will a complete novice like myself be able to appreciate the scientific elements of the performance? The most amazing thing about physics is its beauty. Like most non-scientists, I struggle with difficult science and maths because the language seems so alien. All those equations! But in writing ‘Field’, I deliberately avoided using “science” words like “quarks,” “fermions” and “bosons,” which many people might not understand. Instead, I use metaphor. Some of the themes of Field are surprisingly simple. For example, the symmetries which underlie reality are not unlike the ‘Ideas’ of the Ancient Greek philosopher, Plato. The fact that symmetry is broken in our universe (by the Higgs) reminds me of Plato’s belief that we cannot see “true” reality, only its partial “image.” You don’t need to know any science to grasp the basic idea. Field will be introduced by physicist Tom Lancaster of Durham University. Tom’s talk is intended for an audience with no scientific background. Even without his explanation, there is plenty for the non-scientist to enjoy in Field. When we wrote Edge, I felt that piece took us out into a cold and hostile universe. Human consciousness seemed an incredibly lonely and insignificant thing. Writing Field has had an opposite effect on me. I find the sheer beauty of the symmetry transformations within the equations immensely moving. They touch me like music or great architecture. As a poet, I would call that aesthetic experience spiritual. Some scientists would not agree with that description, but every scientist would know what I mean. I hope that Field will give everyone some access to that beauty. Are there any plans to tour Field around the country? We would love to take Field elsewhere and welcome expressions of interest. The pair of you have collaborated in the past on the radio. How has it been different collaborating for a live performance? Our two previous pieces, Horse and Edge, were broadcast on Radio 3 and 4. We’ve also produced Horse as a CD and book. But both are primarily performance pieces, recorded for radio in live performance. Surround-sound does not translate well to stereo radio, which loses much of its musical complexity. You lose the planetarium visuals with radio, too. There’s really no substitute for the live performance. Are there any more plans to collaborate again in the future? We currently have plans in development with Think Physics at Northumbria University, for a new piece which we hope to make for Life planetarium next year. Life Science Centre is wonderful to work with and Field is a fantastic collaboration with the planetarium team. We’re very grateful to them. Peter and I welcome opportunities to work together on interesting projects. We want each piece to be different from the last. I don’t know of anyone else doing work like us. We’d love to hear from interested venues or sponsors! Field by Peter Zinovieff and Katrina Porteous takes place at Newcastle’s Life Science Centre Planetarium on Tuesday 21st and Wednesday 22nd April at 5pm.